While classic white ceiling paint is a go-to for homeowners, why not consider colour? A rich navy blue or deep black ceiling can blur the boundaries of a room, making it look endless yet intimate. Painting a ceiling with a lighter shade or a slight variation of your wall colour delivers depth and dimension, without breaking the unity of existing colour schemes. 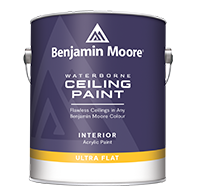 White is a common choice, but you can choose virtually any colour to paint your ceiling, as Benjamin Moore offers thousands and can match the shade you desire. Start with painting the edge of the ceiling where it meets the wall first. Cut the ceiling in like you would cut in a corner. Starting in the ceiling line, brush into the corner and feather paint 2-3 inches and down onto the wall. 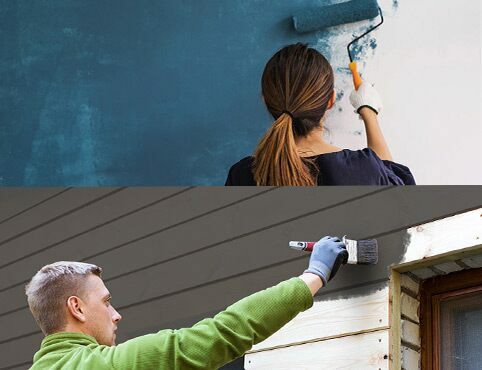 If you aren’t going to paint the walls, use painter’s tape to protect the wall or use the brush to cut in a nice straight line along the wall’s edge.